The Cylinders are an extremely talented group of musicians who have come together over the years through knowing each other from a circle of friends to playing together as one of the elite upcoming bands on island. If you haven't yet seen them, you are missing out. They have a solid, professional, well-rehearsed sound playing originals with the dark feel of Pink Floyd and The Doors, to light poppy music with the feel of the Lemonheads, to pure funk. The original Cylinders band was formed in Cleveland, Ohio back in 1993 as a solo acoustic project, but the group evolved its sound into something else. The group eventually split up, but not before putting out two albums titled "The Cylinders" and "Personal Ads," which both did well with fans of the group. Eventually, Don Jankas, one of the four founding fathers of the group, moved to Okinawa, and at the recommendation of Ikari and Rod, decided to set the Cylinders in motion again, revising a few of the old songs and writing many new ones in the process. 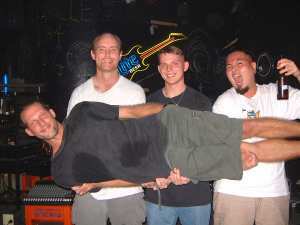 The Cylinders are comprised of rhythm guitarist and vocalist Don Jankas, bassist and backup vocalist Will Kesling, a prior member of Zero Faith, lead guitarist and backup vocalist Ikari Ishikawa, who played with Don Jankas in Acoustic Static for three years and in the popular local band Y2Rock, and drummer Rod Nakama. Will Kesling and Rod Nakama do an excellent job of holding the backbone of the band together with their fantastic bass playing and precise drumming. I was especially impressed with the group's darker songs that have more of a gentle Pink Floydish feel with trippy guitar tunes. It sounds like a disturbing circus of sound and drumming. It transitions from soft to crashing and back to gentle sweeping while the rhythm guitar and bass lay down foundations for the song and the story at hand. Some of their other original music has a folky, singer-songwriter feel with catchy melodies that has a hint of The Lemonheads and other folk-rock groups. Recently, the group had to give up their bassist Jonus Cocksun to serve in the efforts against terrorism. He hasn't yet left Okinawa, but he is currently packing his bags and could leave anytime. The group was forced to search for another bassist for the time being, and luckily, Will Kesling volunteered to help the group stay afloat. Will is one of Okinawa's most talented bassists and hopes to help get the band off to a good start. Each member of The Cylinders have different hopes and dreams for the band, but their overall goal seems to be the same: to get The Cylinders heard and accepted by both the American and Japanese audiences in Okinawa through their original sound. Ikari says he is dreaming to make the band famous in the mainland and feels that where Japanese rock has a bit of a weaker sound than it did in the past, he hopes to mix the sounds of both cultures into his music. "We want to break down the musical boundaries between Japanese and Americans and show that foreigners can write pretty good songs," says frontman Don Jenkis. Lyrically, Don admits to being inspired by songs of Van Morrison, Tom Petty, Neil Young, and Cat Stevens, and as for guitar, his music writing has been influenced by folk. "When I started learning to play guitar, my first teacher was big into bluegrass. I've been writing songs since I started playing in 1988, and most of my music is folk based, but our music comes out heavier when we play together as a group," says Don. He adds, "We just hope people will come out and see us and know we don't have big egos." The Cylinders will perform next on Oct. 17, and 31 at The Hideaway, and on October 12 and 13 at 7th Heaven Koza. For more information on the group's band dates, check out their website at Cylinders. Overall, The Cylinders are a solid band with professional sound. If you haven't seen the band live in action yet, be sure to stay tuned on the band's upcoming dates. You will definitely be seeing more of this talented band as their reputation builds over the months and years ahead.